Dark Horse Comics are in touch with the Devil this June... or at least a guy whose red like the devil, and has biggest case of arm wrestling strain the world has ever seen. It's Hellboy, and of the four hottest covers in their June line-up he easily takes out two spots. 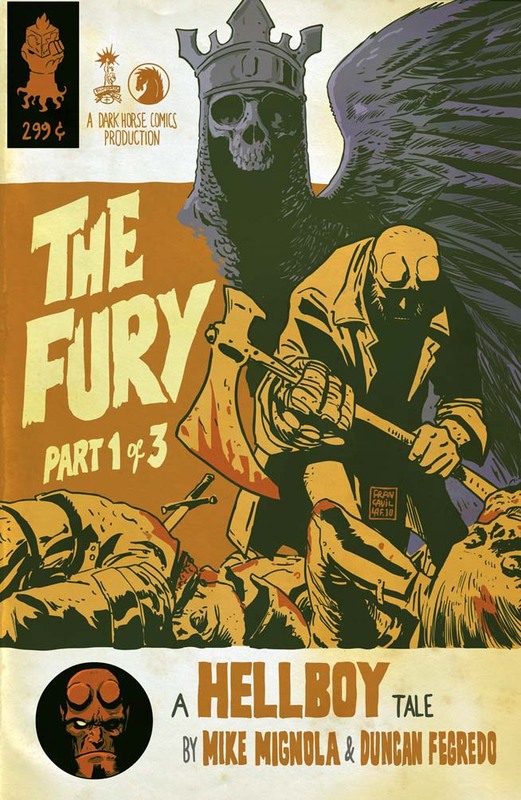 ONE TO WATCH: Francesco Francavilla - Hellboy: The Fury #1 My favourite TWARTist takes on the character that defined 'creator owned', not just in sales but also in style. A sucker for anything with type worked into the image, this would definitely the variant I'd be hunting if this book was on my chopping block. ARTIST AND TITLE: Eric Powell - The Goon #34, Gregory Manchess - Solomon Kane: Red Shadows #3, Mike Mignola - Hellboy: The Fury #1. More Dark Horse June madness after the jump.